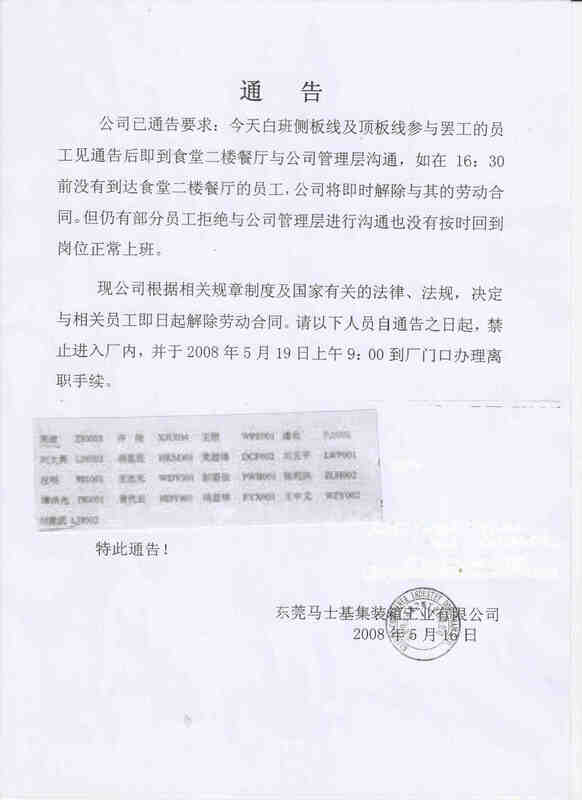 We were workers at the Maersk Container Industry Dongguan Ltd. We were unlawfully dismissed by the management on 12 and 16 May 2008 respectively for supposedly ‘illegal’ strikes. The company’s action has neither legal ground nor any justifiable reasons. We asked for negotiation with the management but were rejected. We are now writing to you to demand that you meet with us. China has no law whatsoever that prohibits strikes. Therefore dismissing workers on the grounds of ‘illegal’ strikes is wrong. In addition to this Maersk, as a transnational company, should follow International Labour standards, i.e. recognizing workers’ rights to strike. The 11 May 2008 strike broke out because workers discovered that their salaries were actually lower than what the management had promised. Another grievance was that the wage structure was far too complicated for workers to comprehend. Therefore workers struck on 11 and 12 May. These dates were a Saturday and a Sunday (scheduled as overtime workdays). 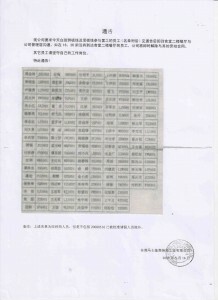 On 13 May, the management posted a notice announcing that 29 workers were fired on 12 May. The move was to punish workers for their strikes. Yet the 29 workers who were dismissed all worked in the same section; the reason they were chosen for dismissal only because their section was the least important work station. As for the 16 May 2008 strike, it happened four days after the 12 May Sichuan earthquake. Maersk did nothing for the earthquake in that period, hence some workers wanted to initiate fund-raising for the victims. One worker went to the management to make suggestion to the latter on fund-raising for the victims. The manager did not respond to the worker’s suggestion, instead he fired the workers’ team-leader. This triggered off the anger of 87 workers who went on strike. 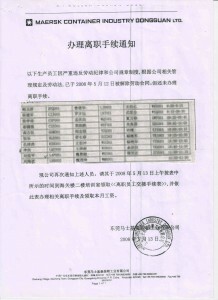 On the same day, the management posted a notice asking the striking workers to meet with the management. The meeting, however, had nothing to do with fund-raising, and was instead to ask workers to sign an agreement to go back to work. Many workers were forced to sign while 15 other workers rejected. The management immediately dismissed these 15 workers. The underlying reason behind the two strikes in May 2008 was the management’s reluctance to communicate with the workers, and its arrogance and disrespect in the way it treated workers. This eventually aroused workers’ anger so much that it culminated with strike action. Maersk, as a transnational corporation, should follow International Labour Standards and recognize workers’ rights to strike. Maersk should also recognize workers’ rights to collective bargaining, and for that purpose it must provide an effective channel for negotiation with workers. Since the dismissal of workers is unlawful and unreasonable, Maersk should withdraw its wrongful decision, and reinstate the dismissed workers. Reinstated workers should be paid the same average wages as before. Maersk must compensate dismissed workers for their loss of income from the date of dismissal till the date of their reinstatement. Maersk must pay them according to their normal average wages. If any worker concerned does not prefer reinstatement, Maersk must, in accordance to Labour Contract Law article 47, compensate them. The compensation should be linked to length of service: for every year of service workers must be paid one month’s wages; those who worked for more than six months but less than one year should be regarded as having worked one full year and should be paid one month’s salary; those who worked less than six months should be regarded as having worked six full months and be paid half a month’s salary. In addition to this, a sum of money equivalent to one month’s salary should be compensated to workers for in lieu of notice. Maersk should immediately arrange medical inspections for workers in accordance with the laws. Maersk must be responsible for all the expenses of medical inspections as well as related medical treatment when workers are found to have occupational diseases. If workers are diagnosed as being under medical observation or are suspected of having occupational diseases, Maersk must re-instate these workers as required by law. In addition to this, Maersk must compensate these workers in accordance to the principle laid down in the aforementioned point 3. Maersk must pay back the unjustifiable fines to workers (along with interest). The 15 minute meeting before work should be paid as overtime payment. 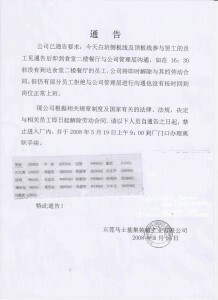 Maersk must apologize to the workers openly for wrongfully dismissing workers for the 16 May 2008 strike. The following workers have seriously violated the labour discipline and the company’s rule. 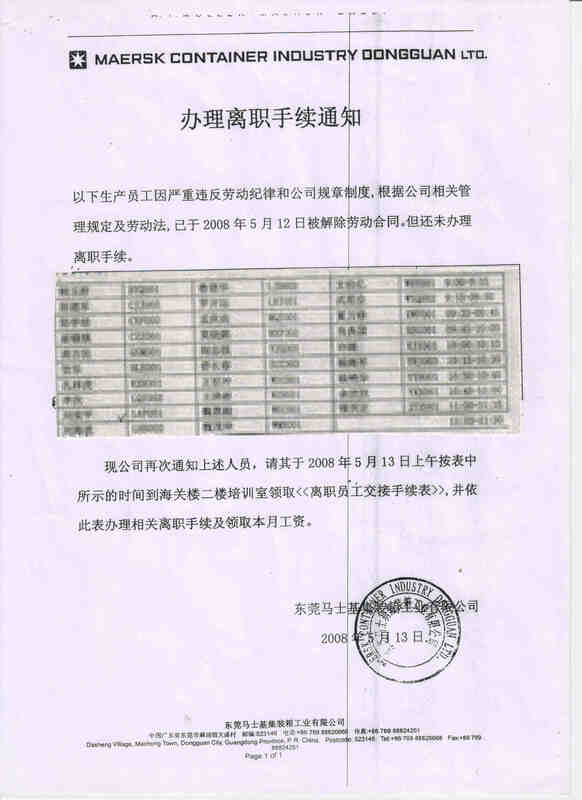 According to related rules and labour law, these workers are dismissed on 12 May 2008. These workers have not gone through the procedure of termination of contract. We hereby notice the above workers again. Please come to our training room at the time as listed above to get the “Form for termination of contract”. Workers need to go through the procedure as instructed in the form and get this month’s salary. The day-shift workers of the Side-cover station (側板線) and the Top-cover Station (頂板線) (see the names listed below) who participate the strike today must come at once to the 2nd floor canteen to meet with the management. Workers come later than 16:30 will be dismissed immediately. As for other workers, please stay on your duty. Remarks: The above list does not include workers who are approved for leave on 16 May 2008. As in our last notice mentioned, the day-shift workers of the Side-cover station (側板線) and the Top-cover Station (頂板線) must come at once to the 2nd floor canteen to meet with the management. Workers come later than 16:30 will be dismissed immediately. However, there are some workers who have rejected to communicate with the management and did not report duty as usual. According to related rules and national laws and rules, we have decided to terminate the following workers immediately. 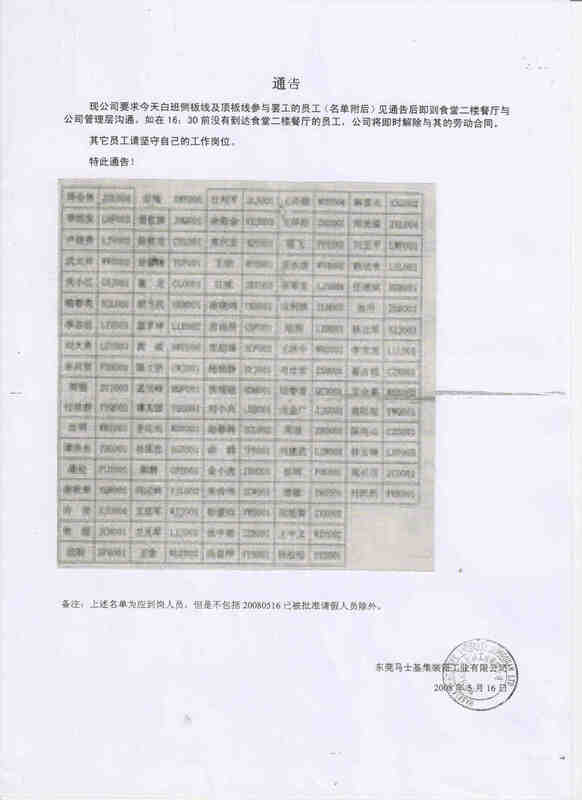 The following workers are prohibited to enter the factory effective from the issue of this notice. These workers should come to go through the procedure of termination of contract.